92 MMS November 2017 mmsonline.com FEATURE product and machine. These inputs are unit sales price, unit material cost and the hourly operational expense (OPE X ) of the machine. FOEE is the current-state hourly profit divided by a value representing a world-class level of profit. This ratio tells a company what profit it made com- pared to what profit could have been made at factory-best or world-class levels. With FOEE, managers can look at jobs sched- uled for a machine and make decisions based not just on utilization, but also on utilization and profit. This enables managers to compare machines capable of running a certain job and determine which machine would yield the highest hourly profit. Just as the OEE figure related to each project or job is a key tool in prioritizing and evaluating continuous improvement projects, FOEE provides a quick view of the profitability opportunity for these projects. FOEE is a tool to make better business decisions for scheduling products, guiding continuous improvement efforts, and driving sales and marketing efforts. PEOPLE POWER IN THE PICTURE Mr. Hosmon began by explaining that the pro- ductivity and the profitability of shopfloor perfor- mance has much to do with human behavior. How well operators are performing their duties to keep machines running and keep jobs on schedule is a major factor contributing to a shop's success. The president of Refresh Your Memory Inc. (San Jose, California), the developer of the FactoryWiz Monitoring system, noted that customers are primarily preoccupied with concerns over machine performance and utilization. This is why OEE is a popular measure of shopfloor activities. However, the data from machine-monitoring systems can also help a company enhance the contribution of shopfloor personnel in the pro- ductivity equation. In fact, this data can be a valuable tool for many human resource functions such as c onducting e mploye e pe r for ma nc e reviews, managing incentive programs, setting goals and identif ying training needs. 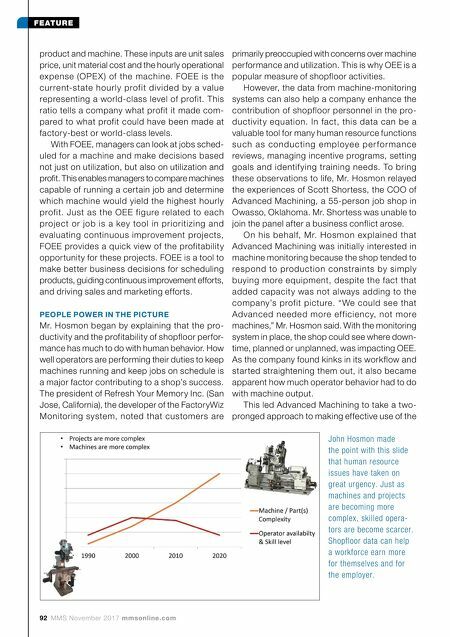 To bring these observations to life, Mr. Hosmon relayed the experiences of Scott Shortess, the COO of Advanced Machining, a 55-person job shop in Owasso, Oklahoma. Mr. Shortess was unable to join the panel after a business conflict arose. 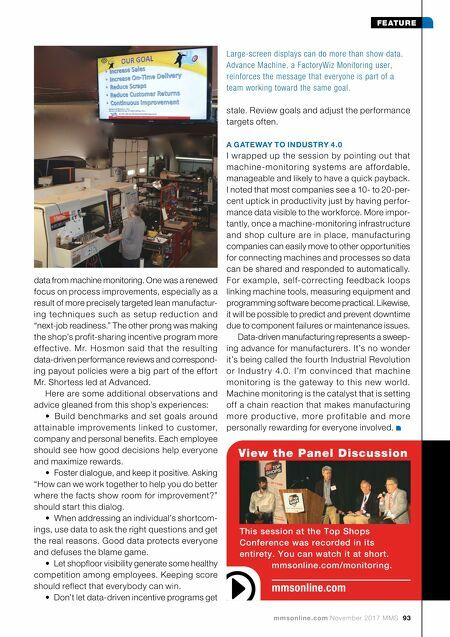 On his behalf, Mr. Hosmon explained that Advanced Machining was initially interested in machine monitoring because the shop tended to respond to production constraints by simply buying more equipment, despite the fact that added capacity was not always adding to the company's profit picture. "We could see that Advanced needed more ef ficiency, not more machines," Mr. Hosmon said. With the monitoring system in place, the shop could see where down- time, planned or unplanned, was impacting OEE. As the company found kinks in its workflow and started straightening them out, it also became apparent how much operator behavior had to do with machine output. This led Advanced Machining to take a two- pronged approach to making effective use of the John Hosmon made the point with this slide that human resource issues have taken on great urgency. Just as machines and projects are becoming more complex, skilled opera- tors are become scarcer. Shopfloor data can help a workforce earn more for themselves and for the employer.